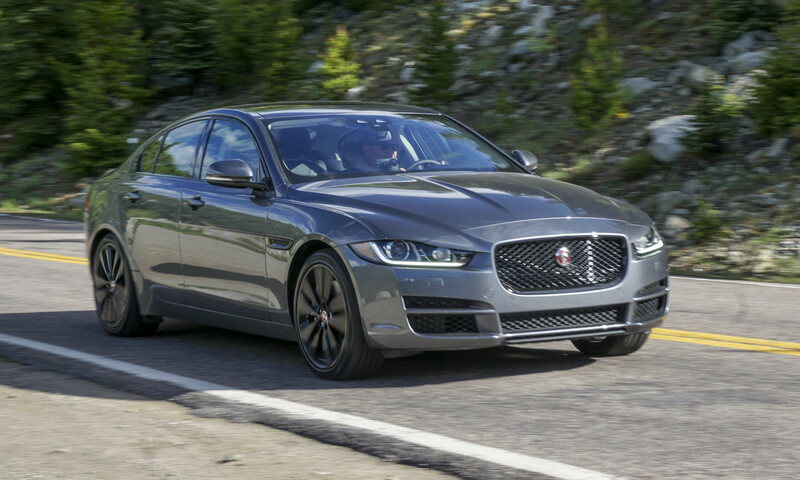 Jaguar has been on a roll lately, with a constant flow of new models coming to market. 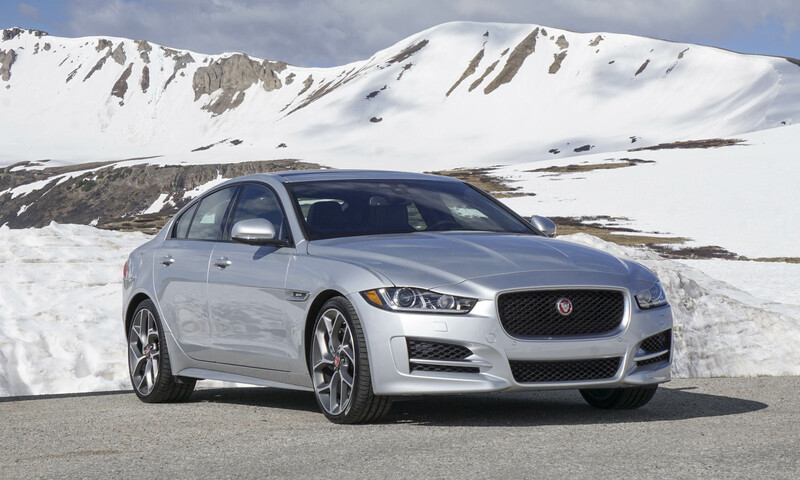 One of the latest is the all-new XE sport sedan, positioned as the entry vehicle in the Jaguar lineup. 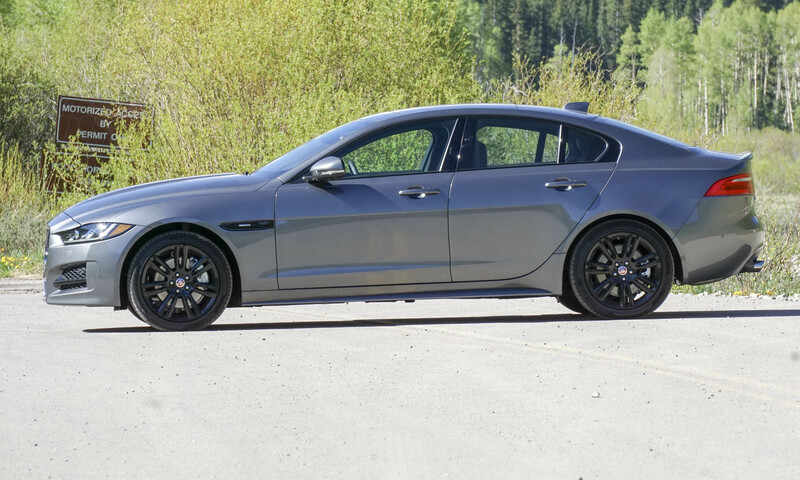 For those of you who remember the X-TYPE from the early 2000s, you’ll be happy to hear that the XE is nothing like that early sedan. 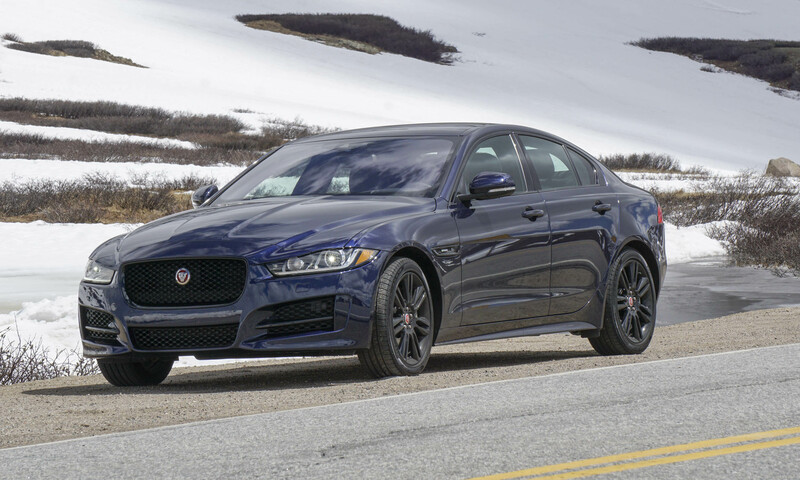 Sporting the same stylish grille as the XF and XJ, as well as a powerful engine and great handling, the XE is likely to give the established sport sedans from German automakers a run for their money. “Our mission was to create an exciting and dynamic design clearly reflecting the XE positioning as a serious driver’s car. The cab-rearward proportions and tight packaging achieve that and give the XE the appearance of movement even when it is standing still. 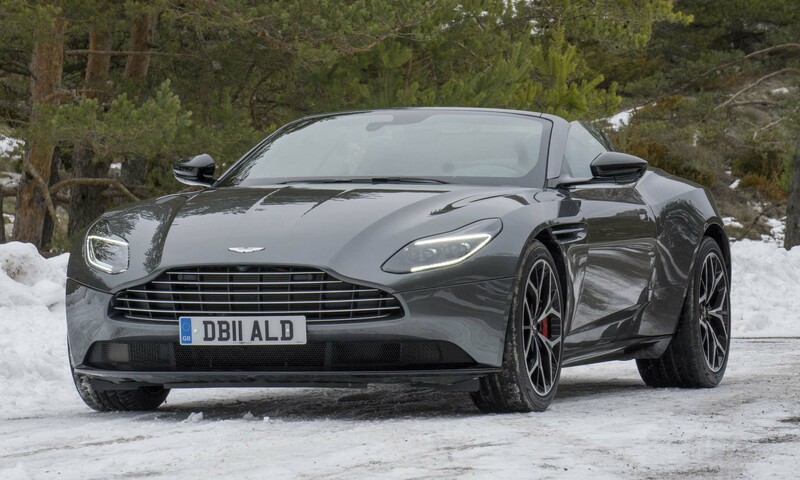 It bears a strong family resemblance to the F-TYPE and will stand apart in the crowd,” notes Ian Callum, Jaguar’s director of design. 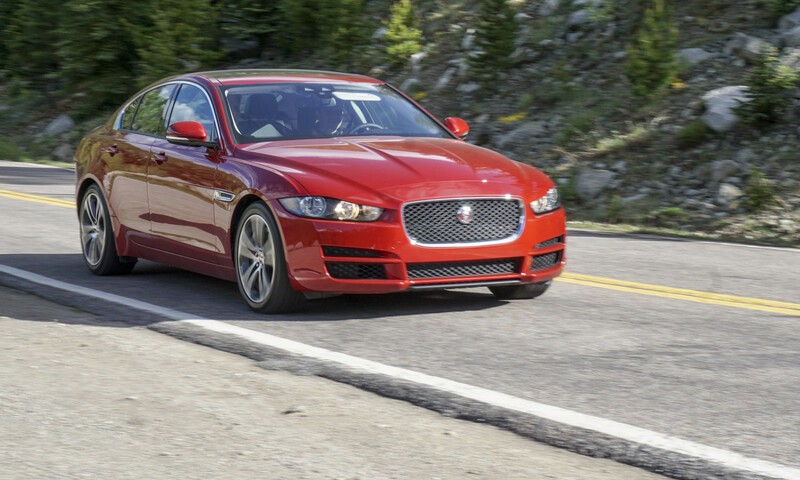 The new Jaguar XE is available as the 20d, 25t and 35t, with the name designated by the XE’s powerplant. There are also four different trim levels: XE, Premium, Prestige and R-Sport. 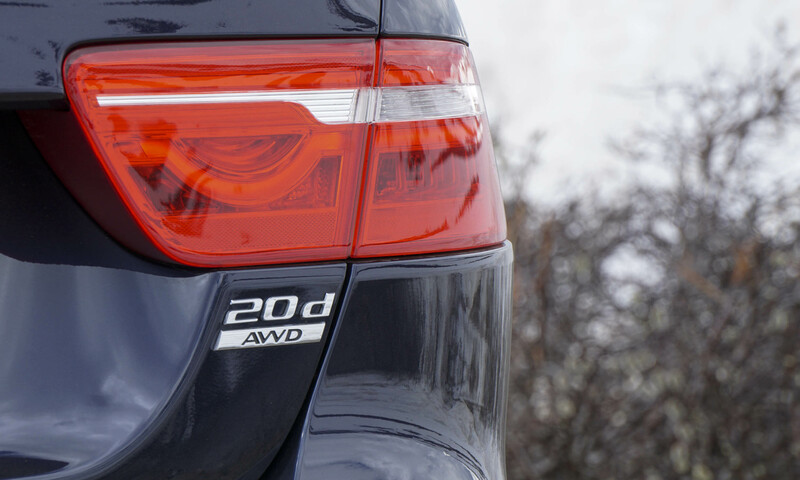 Rear-wheel drive is standard on all XEs, with all-wheel drive available on the 20d and 35t for an additional $2,500. All XE variants feature advanced aluminum-intensive lightweight construction that translates into impressive driving dynamics. 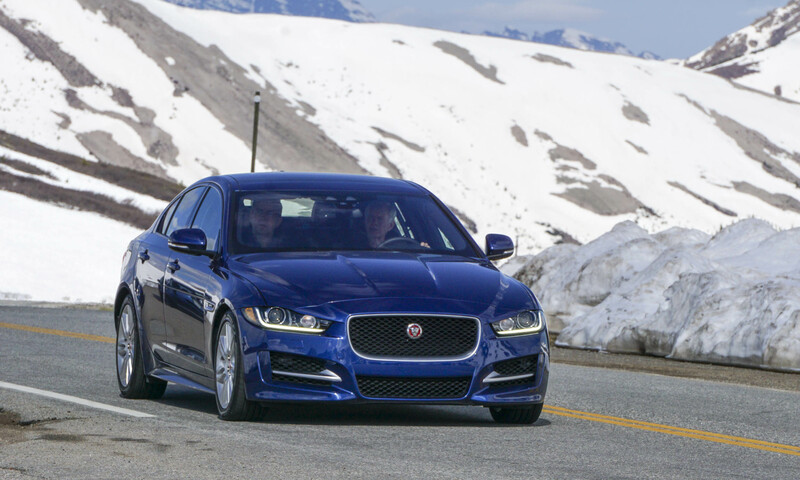 The base-level trim of the XE starts at a surprisingly low $34,900. Standard equipment includes dual-zone climate control with solar sensing, 10-way power front seats, a power moonroof, rain-sensing wipers, Bluetooth connectivity, an 80-watt sound system and an 8-inch touchscreen display. The base XE also comes with 17-inch 5-spoke alloy wheels as well as cornering brake control and dynamic stability control. 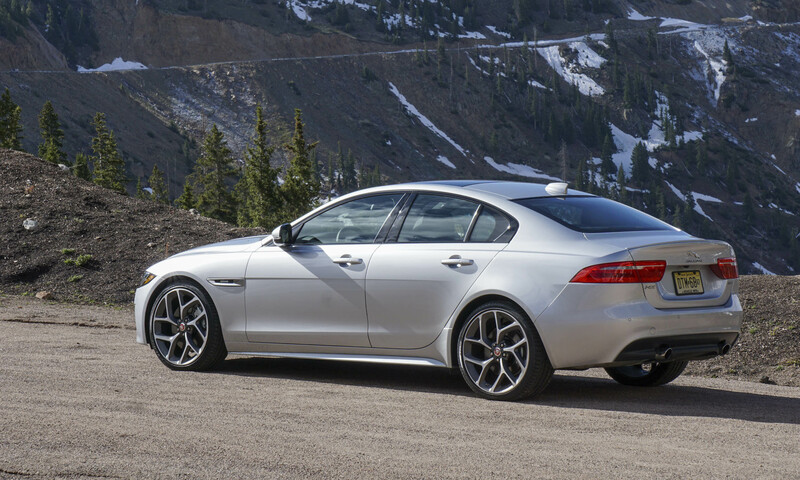 For an additional $2,600 buyers can move up to the XE Premium. Additional features include a rearview camera, an upgraded Meridian 380-watt sound system, a split-folding rear seat, heated rearview mirrors with puddle lamps, and 17-inch twin-spoke alloy wheels (18-inch on 35t). 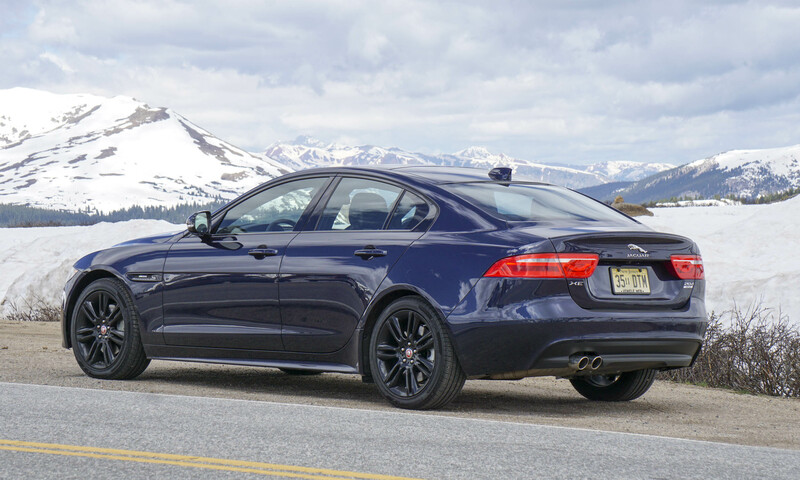 Priced at $41,400, the XE Prestige adds heated leather seats, power lumbar support, mood lighting, keyless entry, a power-adjustable steering column, voice control and 18-inch 6-spoke alloy wheels (19-inch on 35t). 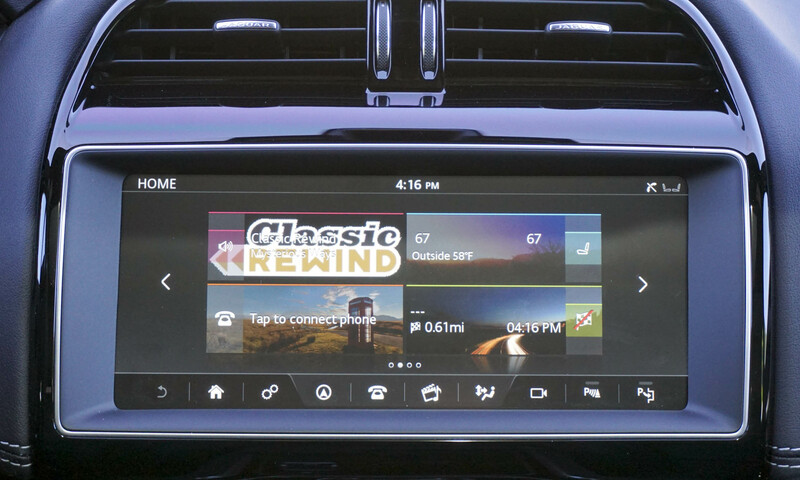 The Prestige also receives Jaguar’s InControl Apps, which integrates certain smartphone apps into the car’s infotainment system. 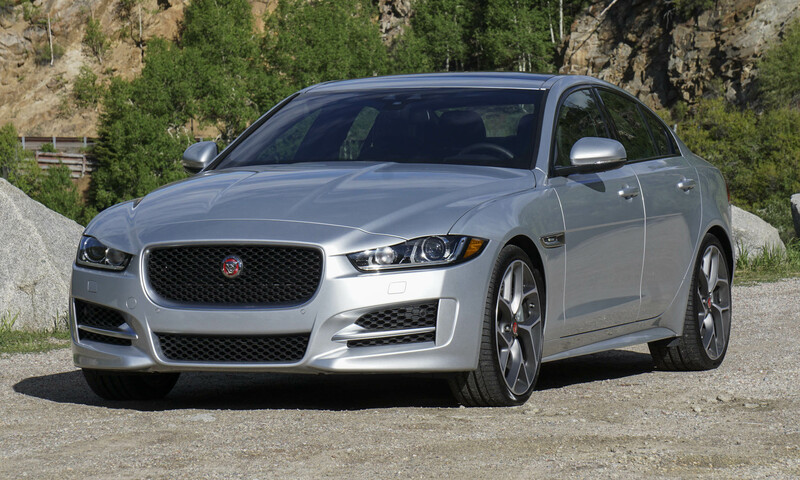 Residing at the top of the XE lineup, the R-Sport has a starting MSRP of $46,500. In addition to the features found on the lower-level trims, the R-Sport is equipped with sport seats, an R-Sport body kit, 19-inch Venom 5-spoke black alloy wheels, a rear spoiler, adaptive Xenon headlights, LED daytime running lights, Lane Keep Assist, Blind Spot Monitoring, Reverse Traffic Detection and Autonomous Emergency Braking. The R-Sport also has an available Driver Assistance package. For an additional $3,200 you get Adaptive Cruise Control, a surround camera system, traffic-sign recognition with intelligent speed limiter and park assist. The 25t sits at the base of the XE lineup, powered by a 2.0-liter turbocharged 4-cylinder engine putting out 240 horsepower and generating 251 lb-ft of torque. Available exclusively with rear-wheel drive, the 25t can reach 60 mph in 6.5 seconds and delivers 21 mpg city /30 mpg highway. 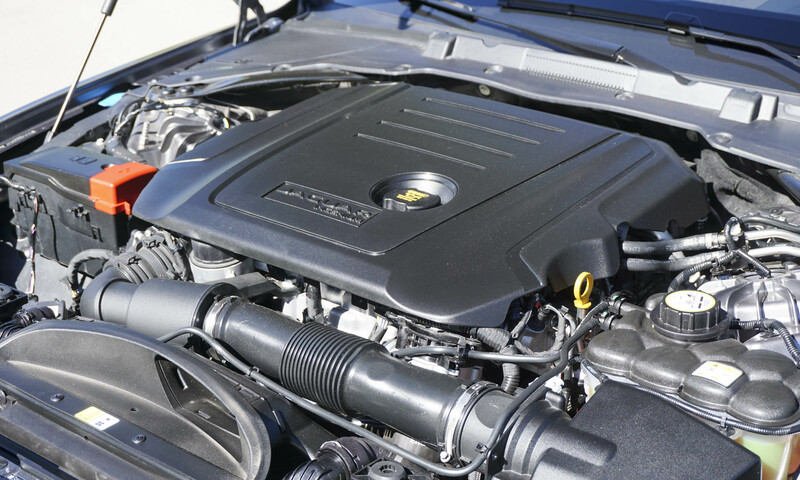 The high-performance 35t gets a supercharged 3.0-liter V6 engine producing 340 horsepower and 332 lb-ft of torque. Even though the 35t is clearly more powerful and quicker to accelerate — 60 mph comes up in a mere 5.1 seconds — fuel economy ratings are identical to the smaller 2.0-liter engine. 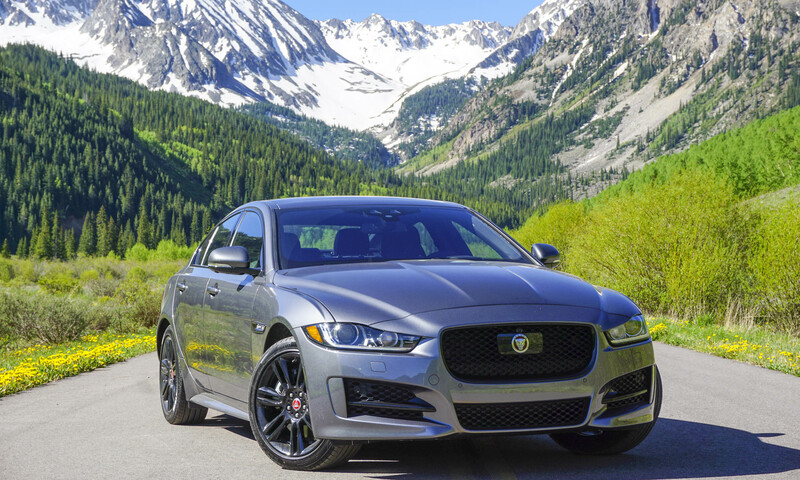 The XE 20d is the first diesel Jaguar in the U.S., powered by an Ingenium 2.0-liter turbodiesel 4-cylinder engine delivering 180 horsepower and 318 lb-ft of torque at a low 1750 rpm. 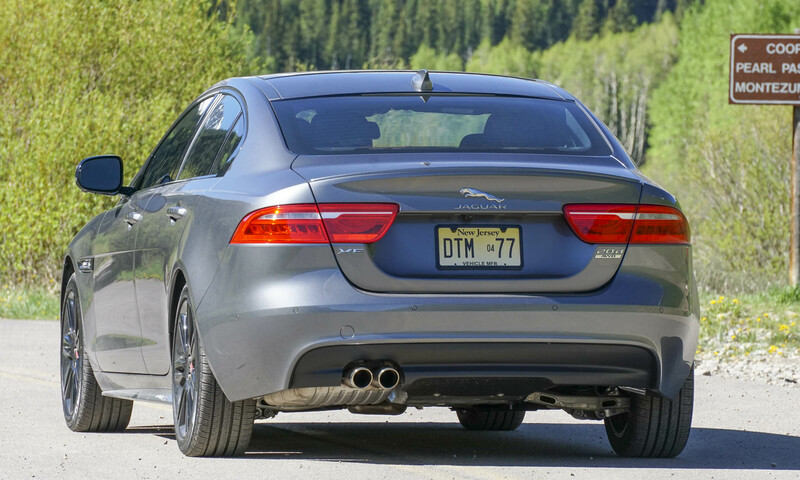 The sprint to 60 mph takes a bit longer in the diesel, with Jaguar reporting 7.5 seconds. Fuel economy figures have not been released; however, during our press drive we observed 39 mpg on multiple trips. 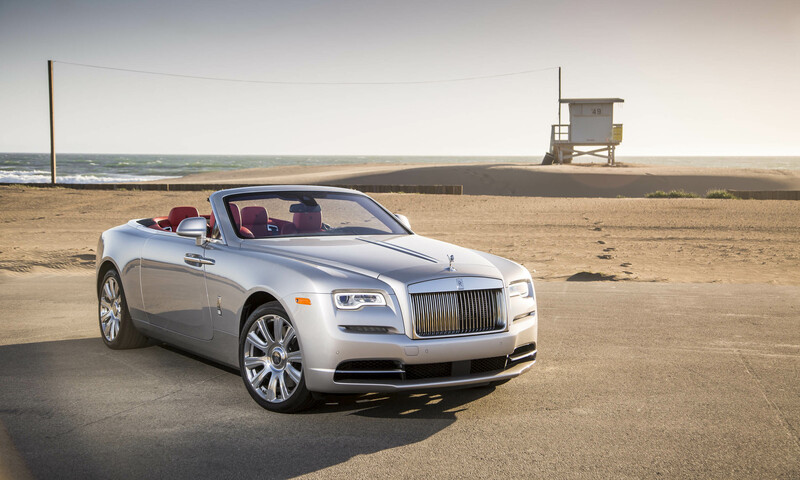 All three engines get teamed with an 8-speed automatic transmission. 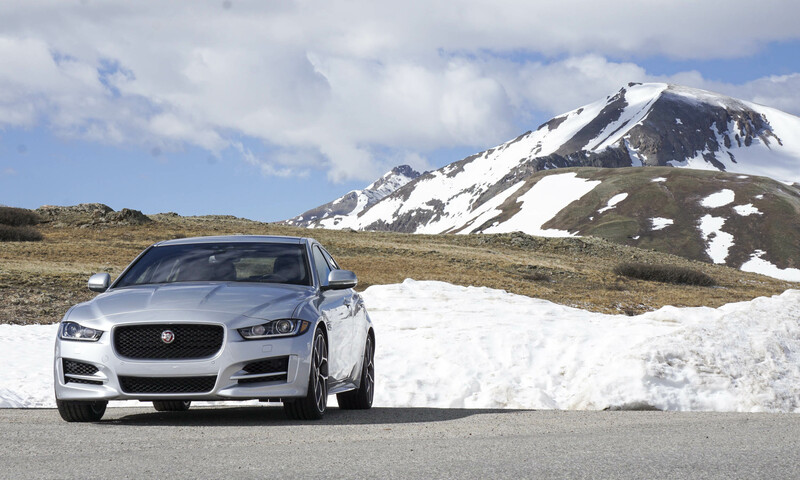 The XE 20d and 35t have available all-wheel drive with Driveline Dynamics. 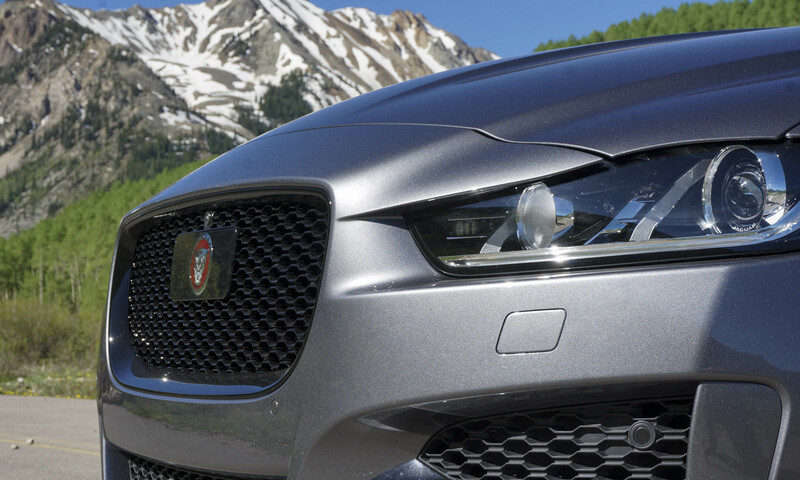 Developed in-house by Jaguar., the system monitors yaw rate, lateral acceleration and steering angle to help prevent the car from losing traction. In normal conditions 90 percent of the torque is directed to the rear wheels; however, depending on traction levels, up to 90 percent can be directed to the front wheels as needed. If slippery conditions make it impossible to pull away without wheelspin, Jaguar’s All-Surface Progress Control can manage traction up to 18.5 mph, working like a low-speed launch control. ASPC must be turned on via a switch — it does not operate automatically. 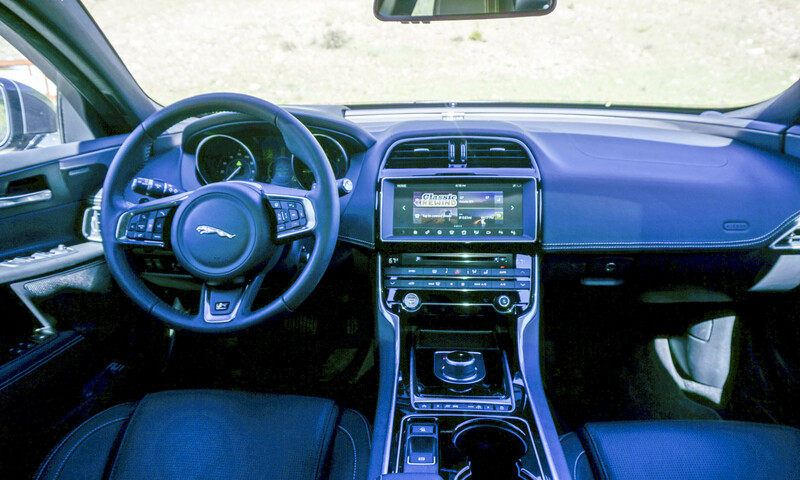 The XE’s interior will be familiar territory to those who have seen inside recent Jaguar models. As with other Jags, the gearshift magically rises out of the center console on engine start. Also similar to the XF and XJ is a trim piece that wraps from the dashboard and flows into the door panels. Although a stylish feature, the design results in a hard angle on the door sill that can become uncomfortable after resting an arm on it for long periods. The XE can also be equipped with a head-up display that projects speed and navigation information onto the windshield in front of the driver. The color display is easy to see unless you’re wearing polarized sunglasses — with sunglasses on it practically disappears. Seats in the XE are quite comfortable and provide good support – especially in the R-Sport. 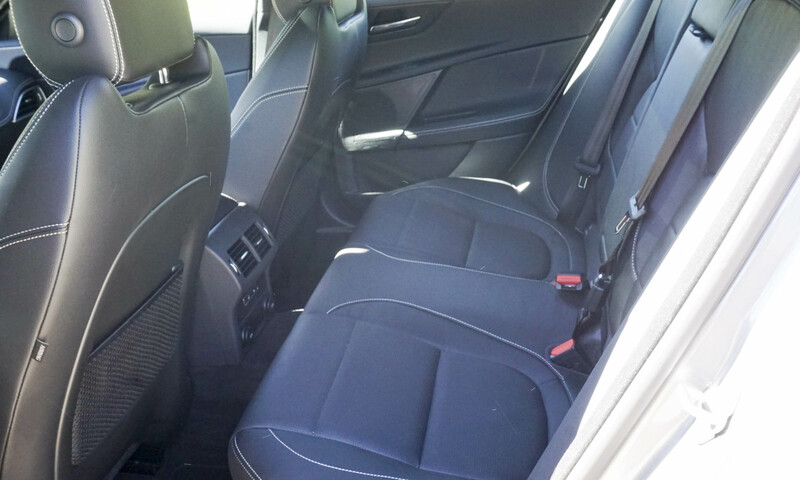 As expected from a smaller sedan, the rear seat is a bit tight for two adults, and very tight for three. That said, the spacious trunk provides plenty of room for several pieces of luggage. 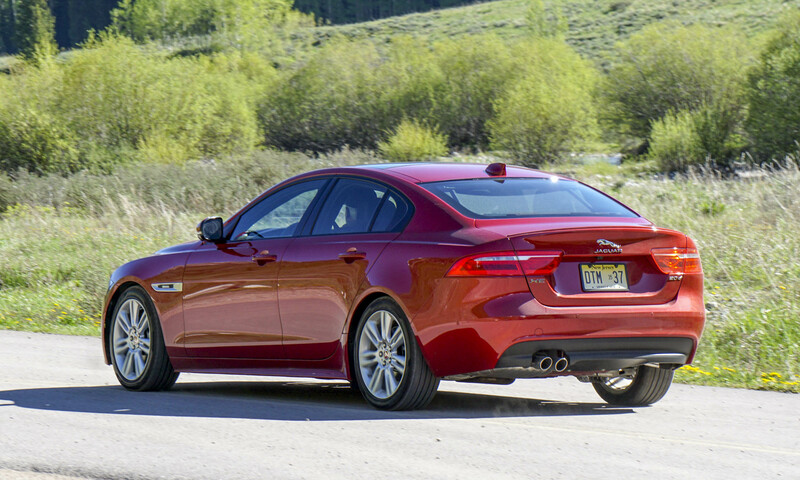 The quiet ride of the new XE is most impressive. On rough roads very little road noise enters the cabin — even with the diesel engine. 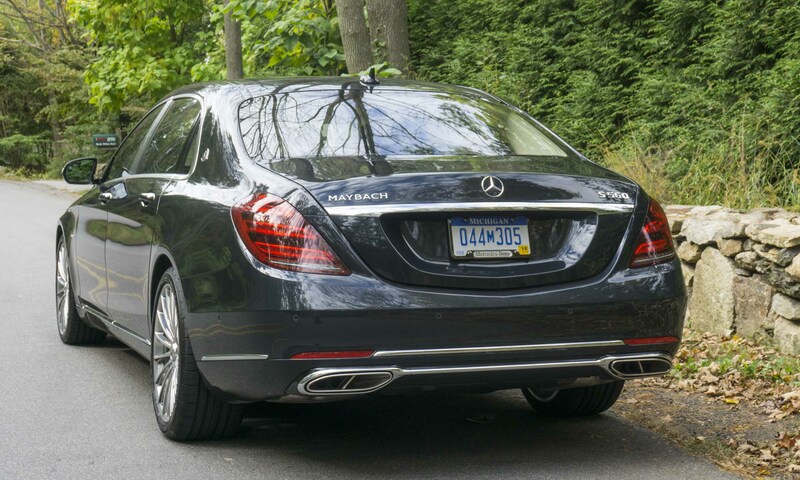 This isn’t often the case in a sport sedan or an entry-level model. Available as an option on the XE Prestige and R-Sport variants, InControl Touch Pro is Jaguar’s latest infotainment system. Featuring a 10.2-inch touchscreen display, the system has a quad-core processor for quick response and capability, as well as a solid-state hard drive that allows pinch-to-zoom functionality. The system also includes an 825-watt Meridian Surround Sound System. 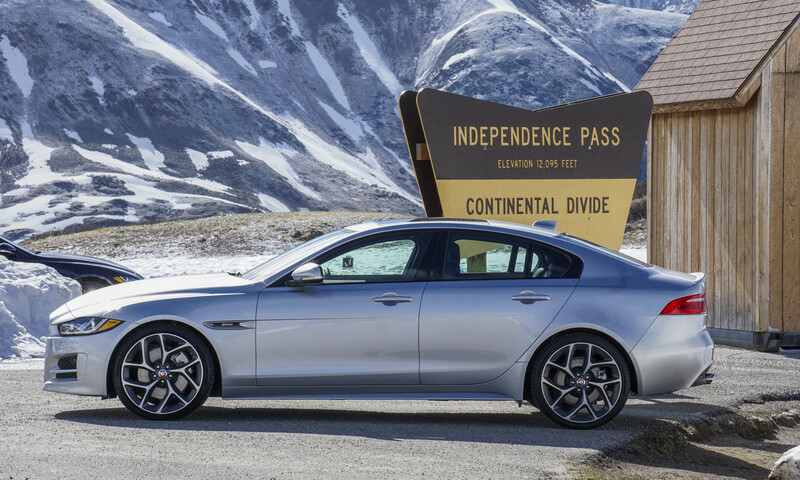 We had the opportunity to take the XE on some winding roads near Aspen, Colorado, and found the car to be incredibly fun to drive. Precise steering makes the XE feel light and nimble in switchbacks, putting a broader smile on this driver’s face with every curve in the road. During the XE press event we drove both all-wheel drive and rear-wheel drive variants, and on dry pavement there wasn’t any noticeable difference between the two. The supercharged V6 engine in the 35t offers plenty of power, and the 8-speed automatic in sport mode keeps the driver fully engaged with quick, smooth upshifts and downshifts. The paddle shifters also perform admirably, with virtually no delay between gear shifts. And in keeping with other Jags we’ve driven, the exhaust note on the XE is commendable for a V6. Although the XE’s diesel variant provides impressive fuel economy — at least according to the trip computer — it feels woefully underpowered. 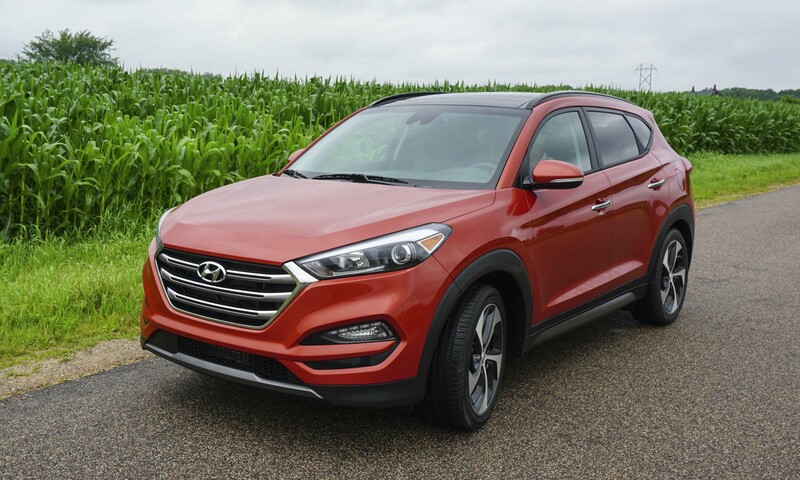 With so much low-end torque the diesel should be more responsive, but on our drive we quickly discovered that considerable time and space were required for passing on two-lane roads. That said, the press drive was at a high altitude in Colorado, which could have affected overall power. 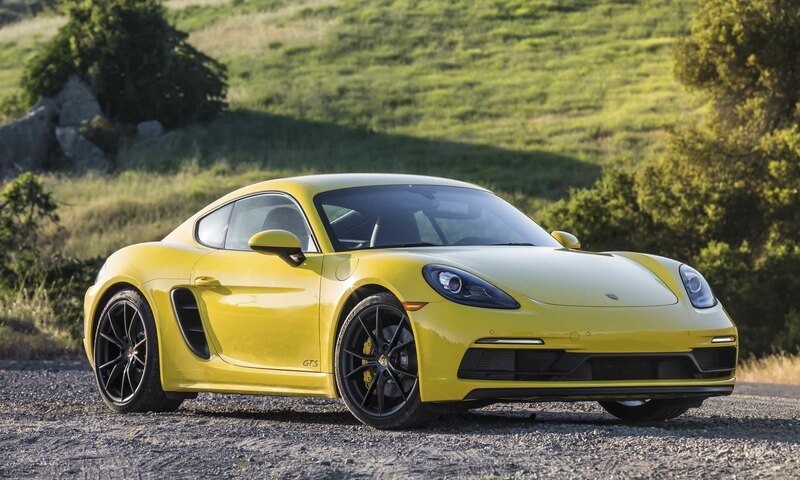 Most buyers in the market for a smaller sport sedan are likely looking at offerings from BMW or Mercedes-Benz — or possibly Cadillac. It’s been a long time since Jaguar offered anything competitive in this segment (some may even argue the brand never has), but the XE is certainly up to the challenge. 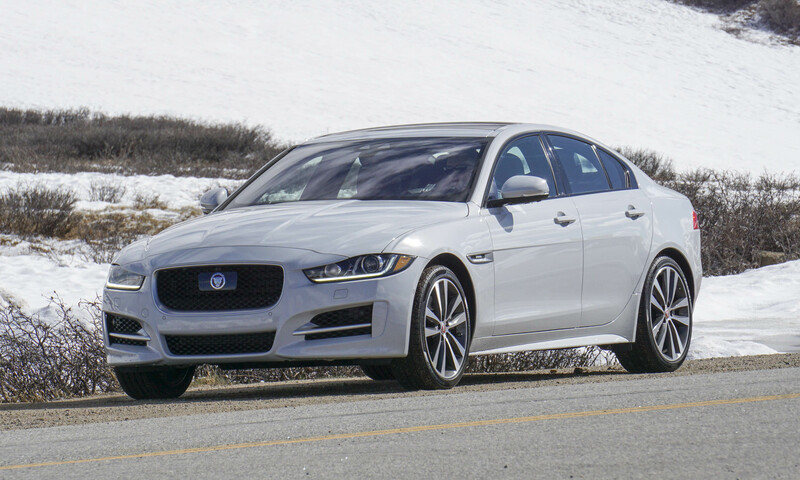 With taught, elegant styling, a comfortable interior, plenty of available luxury and safety features and impressive performance, the XE has the potential to upset the balance in the sport-sedan market. 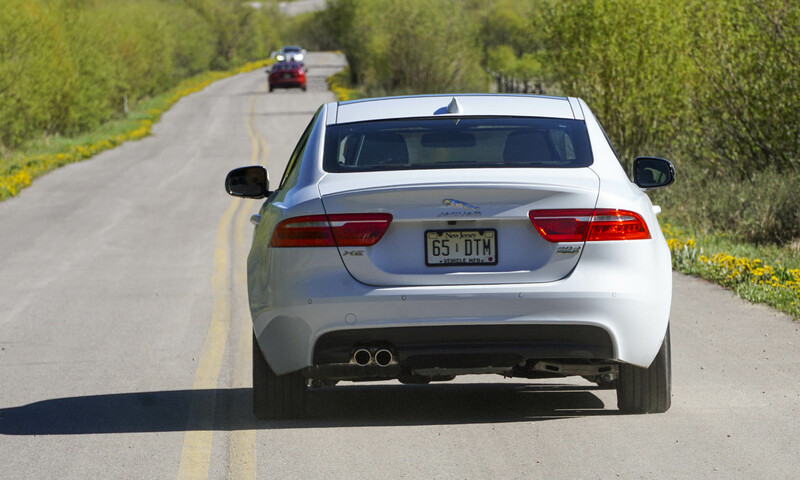 Bottom Line: Jaguar serves up a worthy option in the competitive sport-sedan market. Pros: Excellent performance; great looks; reasonably priced. Cons: Underpowered diesel; cramped back seat.